Bahamas Activities - What they are and How much fun they are! A glossary of activities to do in the Bahamas. When coming to the Bahamas you hear about all of the tours and activities you can do. But, I’ll bet you wonder which ones are right for you? It would hardly be reasonable to expect us to know you well enough to tell you which of the Bahamas activities you would enjoy most. But, to make it just a bit easier we are developing a portion of this site devoted to just that! It will be ranked by other travelers just like you and will offer comments with their ratings. We are hoping this simplifies the choices for you. We also hope the following glossary assists you in understanding what each offering is so that you can preselect many things to make the best use of your time while with us as our guests. 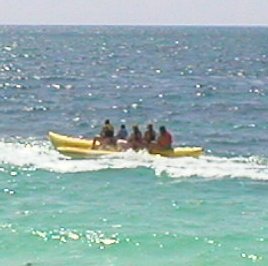 Banana Boat Rides - a large inflated banana - bright yellow with handles for people to hold on with. They come in various sizes seating up to 8 people. The large banana is pulled by a boat while riders of the banana bounce for a more thrilling ride. All riders are given life jackets and sharp turns made by the boat driver are likely to cause the banana to spill over. The boat driver will stop until all passengers are reseated. Child friendly activity. Beach parties - these come in a large variety of options but most are enjoyable boat and snorkeling tours which land on a quiet beach and offer refreshments. Usually lunch is served and planned activities or games or scheduled. Some may include site seeing and others may have a more adult party theme. There is usually rum punch besides fruit punch. This type of tour should be selected carefully where children are involved as many would be a pleasure for kids however the more adult themed parties would not be suitable. Bicycle tours - there are several islands which offer guided bicycle tours, normally nature and eco related. Some may include birding stops. Birding - most islands offer an opportunity for birders either on guided tours or on nature walks individually. Boat charters - nearly every island offers boat charters for a number of activities. Hired individually, many captains will provide a custom half or full day charter. Scheduled boat charters of all types are available for different types of fishing, snorkeling, private diving, beach exploring and picnics and some include visits to remote cay's or islands. Boat rentals - many of the islands have companies who offer half or full day boat rentals. Typically the boats range from 17-19 feet and accommodate a limited number of people. Some offer the option of a captain for an additional fee for those without boating experience. Larger boats generally must be chartered with the captain. Boat tours - There are a variety of tours by boat and they include sailboat tours. Many are scenic and offer shoreline tours, others are more focused on history and settlement or city landmarks. As with the number of different companies offering tours by boat, one will find many options and variations some of which will include other activities as well as a tour. Boating to cay's and islands as tours - there are many tour operators who will gladly take you to nearby cay's or islands as a part of an organized tour. It can be a fun expedition to visit uninhabited isles. Shelling can be unique off the beaten track. Bonfires - offered on many islands these are normally casual and fun gatherings, many of which will include dinner, dancing and games. Some offer native shows with fire eaters and the like. Normally very suitable for children. Booze cruises - Sunset or booze cruises are a popular and inexpensive activity on most any island offering them. Typically offering a rum punch that becomes more potent each batch that is made and an alternative such as lemonade and/or spiked lemonade. Normally the boat will be staffed by very friendly and interactive crew and there will be dancing and music. Most frequently there are snacks served throughout the cruise. Not a substitute for a dinner cruise but for a light hearted night out this is 2-3 hours of fun and dancing. Not appropriate for children. Botanical Gardens - For those interested in botany, these can interesting and informative places to visit. Many offer guided tours and explain the different varieties and the origin. Some are so lush and beautiful that they become the perfect spots for the exchange of wedding vows. While each has its own merit, it is interesting that on the more commercial islands these gardens are combined with other attractions such as petting zoos, flamingos or even alligators to afford everyone something of interest. Car and jeep rentals are available on most islands and allow for you to take in the sites and settlements at your own pace. Dinner Cruises - somewhat self explanatory - most offer specific menus and a sunset sailing while others are made to order by request. There is no typical size vessel or sailing. Some are sailboats, some are small and private operations and your imagination can create just about any type of dinner cruise you desire by charter. Diving - As you can imagine those islands which offer dive companies have some special wonders to share with you. You can also hire a charter to bring you diving but on islands not offering dive shops care should be used to arrange for equipment. On many of the more remote islands getting your tanks filled cannot be accomplished. The Bahamas offers some beautiful and colorful reefs and marine life. Many divers return year after year to dive the vivid and lively reefs. Diving for shell fish and lobsters (seasonal) is also available by guides as an activity. This is not done with tanks but rather is free diving. Dolphin Tours - It is important to emphasize that wild dolphins roam all the waters of the Bahamas and one might see dolphins from land or on boating excursions. There are also companies who take you out for sittings in places that are known for high incidents of the mammals and other companies offering live a boards to dive sites in these areas. There are however, only two islands in the Bahamas offering land based or sanctuaries for dolphins. Those are Freeport/Grand Bahama Island and Nassau/Paradise Island. Both offer a number of encounter type activities. The most frequented is an educational encounter which includes performances by the mammals jumping and brushing up against the spectators who are confined to seating in a specific area. Some offer scuba diving with dolphins after certain training and there is an assistant trainer program at the Freeport facility that gives you an opportunity to work with the dolphins on a daily basis. Obviously these are very sought after activities and one should make reservations well in advance for anything but the general encounter. Eco tours - The Bahamas offers eco systems that are of interest on each and every island. While not all islands have organized tours one can learn from locals where to see and investigate flora and fauna. On many islands there are in existence tours which are well planned around the unique factors that island has to offer. Some of these tour operators will also agree to taking you to other islands to see their eco structure. Most commonly you will find eco tours in the form of hiking, bicycling, kayaking, walking and many specifically for birding. Fish feeding - Normally done from glass bottom boats and snorkeling boats, the fish feeding is a way to bring a lot of activity into view of observers. The generally breaks up bread and throws it in over reefs knowing that the fish will respond in numbers. A great way to show nature to young children not yet capable of snorkeling. Fish Frys - Our cook outs are are called Fish Frys! While they may be scheduled for special occasions or fund raisers, many settlements on Bahamas islands offers regularly scheduled fish frys. They constitute an evening meal and social gathering. Some even include a bonfire on the beach. The obvious fish is served (Bahamian style - normally with heads intact) and at many there are other items such as hamburgers and the like. Fixin's normally will include macaroni and cheese, peas n rice, fried plantains and vegetables. Being they are highly attended by the native population it can be a wonderful opportunity for a foreign visitor to take in Bahamian culture and social life as well participate and feel a part of the family. Fishing: Yep we have fishing in the Bahamas, in fact it is so alluring that we attract fishermen of all types. Bonefishing with its thrill of fly fishing and fight (catch and release sport), reef fishing which is fruitful and kids enjoy as well, deep sea fishing with trolling and big game as well as our tournaments which bring in thousands of boaters and fisherman each year. Glassbottom boats - an easy way to view marine life. You don't even have to float to see the beautiful reefs and fish, eels and other wonders we have awaiting for you. Children love this activity. 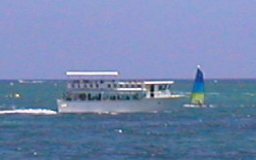 A boat that has glass panels in the bottom is taken over reefs and normally fish feeding occurs while spectators enjoy the beauty. Golfing - On the islands which offer golf courses you will discover that the Bahamas takes its golfing seriously! World class courses, celebrity tournaments and famous designers such as Trent Jones. You can even attend golf school on some of the properties! Hiking Tours - Whether guided or on your own you will find our eco systems to offer much along our hiking trails. Horseback riding - Ever dream of riding on horseback along a beautiful beach, looking out over the azure seas and feeling one with the inspiring beauty? Come to the Bahamas mon! Several of our islands offer a diverse selection of horseback riding stables all of which will bring you to that spot of beauty along the seaside. Island Hopping - While visiting all islands would be an adventure it itself, there are some companies who will bring you island hopping to nearby islands for a day or overnight. It is important to remember that some islands are 100's of miles apart so it may not be possible to simply take an excursion to a particular island. Some companies offer speedboat adventures to out lying cay's and islands as a part of a planned daily activity. These are normally high energy endeavors and are suitable for children. Chartering a private captain and boat would be less to endure in rough seas but take longer. Island Tours - Now here you are pretty much going to be on your own as they occur in such a variety that no two seem to be exactly the same. Some are more of outback tours and others are historic and focused on government, history and markets. They do exist on many of the islands but each has its own unique focus and diversions. Some are simple bus tours with a guide narrating the sites and others land you on a famous beach for an activity filled party with plenty of food and drink and very kid orientated. Some occur as aforesaid, by boat, and others are on buses or jeeps or whatever mode of transportation that the company provides by the sites you will see. Some even combine the transportation to cover both land and water. 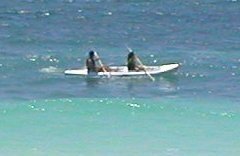 Kayaking - Ocean kayaking rentals are available on many islands for one and two man kayaks. This can be a fun and energetic way to get some exercise on the water. There are also tours wherein you partake of same by kayaking along nature routes. Miniature Golf - Always a favorite this is offered on Grand Bahama Island at two different courses. Native Shows - Often offered with a dinner menu these can be fun and entertaining evening shows. Some of the types of entertainment offered may include fire eaters, Calypso, limbo, and native performers and bands. Native Tours - Angled toward the locals these tours can occur both day and evening and may include a fish fry or native show. Nature tours - Eco orientated and birding orientated tours are available on many islands by guides for those who like to hike, bike or kayak through the beautiful Bahamas. 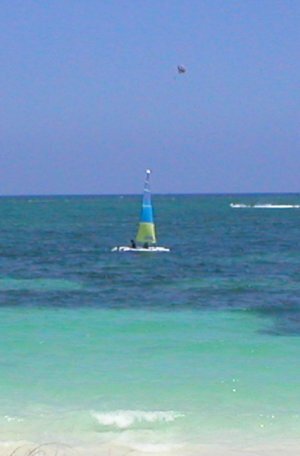 Parasailing - participants are harnessed to a parachute and tied to a boat which "launches" them for high time touring the turquoise seas and beach line. After the ride the participants are rounded back to the same platform where the crew times off the parasailer and lands them onto the float. A favorite with children old enough to follow simple instructions and who meet the weight requirements. Parks - The Bahamas offers both Botanical gardens and parks which include marine parks. These can be explored on your own or with an experienced guide. Sailing - The Bahamas is a sailing mecca. Opportunities for sailing tours and snorkeling are available as well as sunset wine and cheese cruises and other beautiful settings. For a private thrill Hobie cat sailing is available. Scooter rentals - Scooters are available to rent on most islands. Care should be used when operating as they are frequently top heavy so a little practice before entering traffic is wise. Remember we drive on the left! Scooter rentals can be a fun way to explore the islands. Scuba - As you can imagine those islands which offer dive companies have some special wonders to share with you. You can also hire a charter to bring you diving but on islands not offering dive shops care should be used to arrange for equipment. On many of the more remote islands getting your tanks filled cannot be accomplished. The Bahamas offers some beautiful and colorful reefs and marine life. Many divers return year after year to dive the vivid and lively reefs. Semi Sub glass bottom boat tours - where available you get a closer view of sea life on the semi subs as opposed to the traditional glass bottom boats. Shopping - The Bahamas offers a number of duty free products such as liquors, English woolens, china, jewelry, fine glass, crystal and much more. It is also home to handmade straw goods as well as other Bahamian crafts. Snorkeling - most islands offer organized snorkeling tours. Most require boat trips to the reefs for the vivid and lively sea life to be seen. On some islands it may be possible to snorkel from shore. It is important to know where offshore snorkeling is available and if it isn't to hire a boat or tour operator to take you there. Missing the beauty of the reefs would be a shame. Water skiing - Many tour operators offer both water skiing as well as lessons. Water trampoline - a fun, cool and refreshing way to spend the day. Inexpensive and a good way to ensure kids are worn out come night. Wave runners - Large enough to seat two these motorized bikes on water can ride the waves and offer thrills. Normally rented by the half hour or hour. Weddings - The Bahamas has become a sought after destination for weddings and with its pristine beaches and water, 100's of picture perfect settings and highly skilled and plentiful service providers it is no small wonder that so many couples from around the world get married in the Bahamas. For more information see Bahamas weddings. Windsurfing - The sport is always a challenge to novices and a thrill to the experienced windsurfer. The Bahamas can offer some steady winds especially in late winter.